Today I’m sharing with you a new online tool that you can easily use to generate quick cost estimates and comparisons at individual colleges. All you need is to start playing with the universal net price calculator that you’ll find on the website of the Cost of Learning. 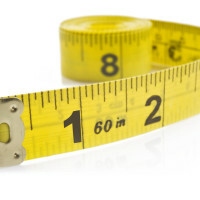 This new website aims to make it easy for families to retrieve net price estimates. The federal government required schools to begin offering net price calculators on their websites back in the fall of 2011. 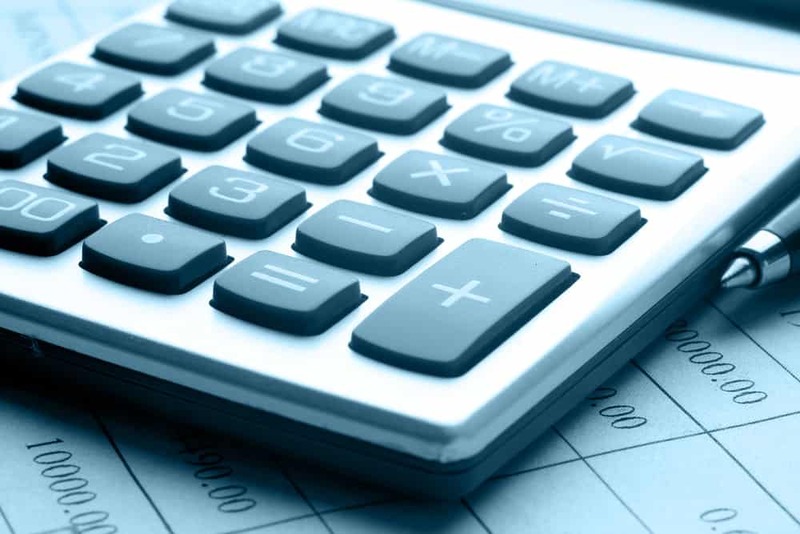 These calculators are supposed to generate personal net-price estimates for an individual student based on the family’s income and assets and sometimes on the child’s academic profile. Don’t Be Tricked By Misleading Financial Aid Letters. The Cost of Learning generated hypothetical net prices at hundreds of schools by trying out many household scenarios of income and assets on the institution’s net price calculator, said Jimmy Becker, the website’s founder and CEO. 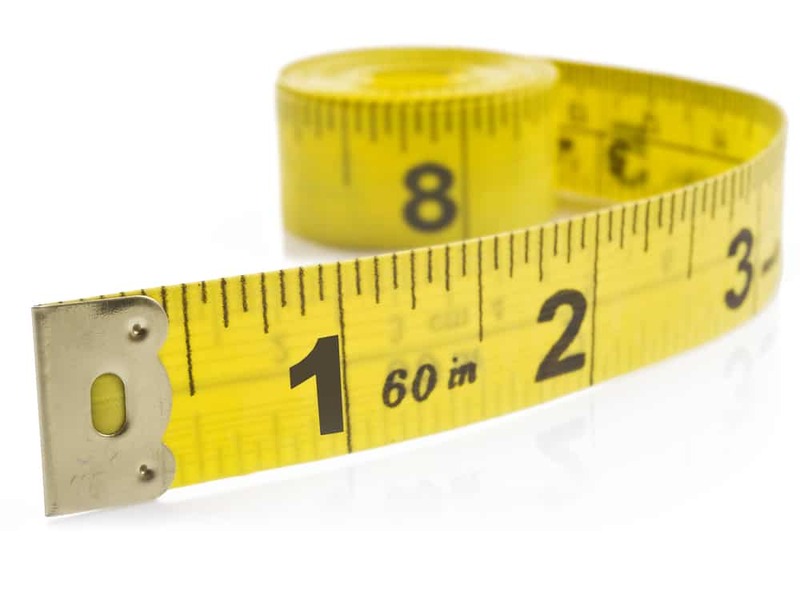 You can learn more about how the universal calculator works by reading the site’s FAQ page. To make calculator results comparable, the creators created institutional net prices by excluding merit aid. About half of all college net price calculators do not calculate merit aid. These are most notably the schools that use simple calculators that depend on an inferior federal template that ask very few questions and only use income ranges. These calculators generate a lot of questionable net-price results. To make these schools comparable to those which do dispense merit aid, Becker did not answer any calculator’s merit aid questions such as – what is the class rank of the applicant, what is his/her GPA and test scores. I’m using the University of Southern California to illustrate what you can find on the site. In the chart below, you can see the net prices for each dot on the graph for USC. When you click on one of the price points, a box will pop up that includes the EFC and the corresponding estimated net price. The arrow in the graph is pointing to the price – $34,036 for a student with an EFC of $24,000. So there is a $10,000 gap between what the student’s family should be paying (according to the EFC calculation) and what USC is charging. A slightly higher gap is present for the other EFC ($18,000) that I checked. USC students with an EFC of $18,000 are expected to pay $28,993. A handy feature of this net-price tool is that you can compare up to six schools at once. In the graph below, I compared the out-of-state costs for nonresidents at five flagship universities along with SUNY Binghamton, which is one of the premiere state research universities in New York. New York doesn’t have a flagship university. Looking at the flagship chart above, you can see that the public universities with the highest college rankings are charging more than the other state universities. I wrote a blog post on this topic last month: Are Flagships Worth the Price for Outsiders? You can also see why low-income students should avoid many flagships universities that aren’t in their own state. The University of Virginia is the only one of the six schools in this comparison that provides excellent financial for the poorest nonresidents. In contrast, UC Berkeley and the University of Michigan expect the most impoverished nonresidents to pay more than $30,000 for one year of school. You can also use the Cost of Learning site to determine if those net price figures are actually accurate. Sadly, many aren’t believable. I’m going to use Boston University to illustrate this phenomenon. 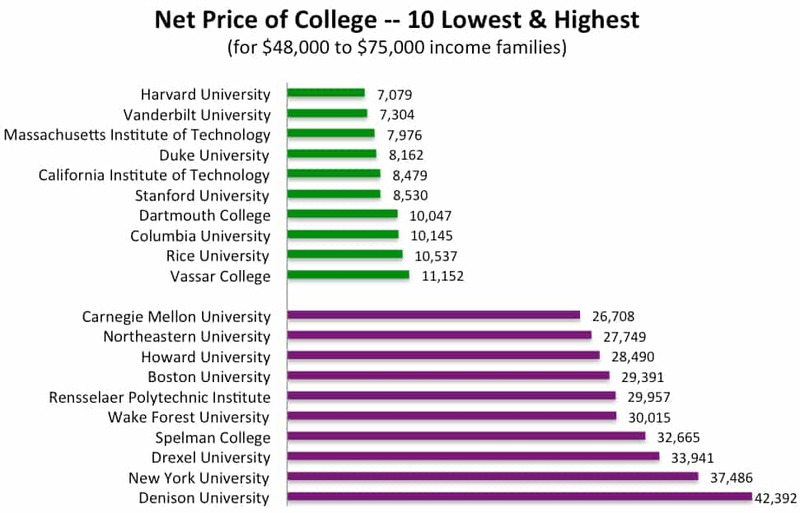 If you look at the results from Boston University’s net price chart, you’ll notice that the calculator claims that poor students pay hardly anything to attend this university. Using BU’s net price calculator, it appears that extremely low-income students (EFC’s of $0 to $1,200) would only who have to pay $1,805 for one year of school. (If you generate BU’s net prices, you’ll see the $1,805 figure by clicking on each of the two red dots in the lower left-hand corner of the graph. 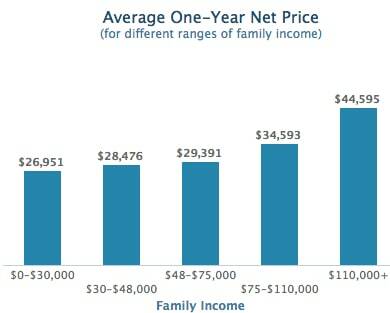 Now look at the chart below that contains the actual average net prices for BU students in different income ranges. Unlike the net prices generated by a school’s calculator, schools must submit these net prices to the federal government and they are supposed to be accurate! According to BU’s federally reported figures, the poorest students must typically pay $26,951 for one year of school! So much for being generous. Looking at BU’s figures, it wasn’t surprising that this school ended up on the list of the most expensive schools for middle-class families with household incomes between $48,000 and $75,000. Becker generated the list by checking the net prices of 72 well-known private colleges and universities. I wasn’t surprised that many of the stingiest schools were universities on the East Coast, but I was surprised that Denison University, an Ohio liberal arts college, was on this list because it claims it meets 95% of the typical student’s demonstrated financial need. But just like the BU example, the net-price averages that Denison reports to the federal government tells a different story! In the example below. I generated the net price charts for two elite liberal arts schools that share a campus in Claremont, CA. Both Pomona and Claremont McKenna say they meet 100% of a student’s demonstrated financial need, but clearly Pomona is the more generous school. 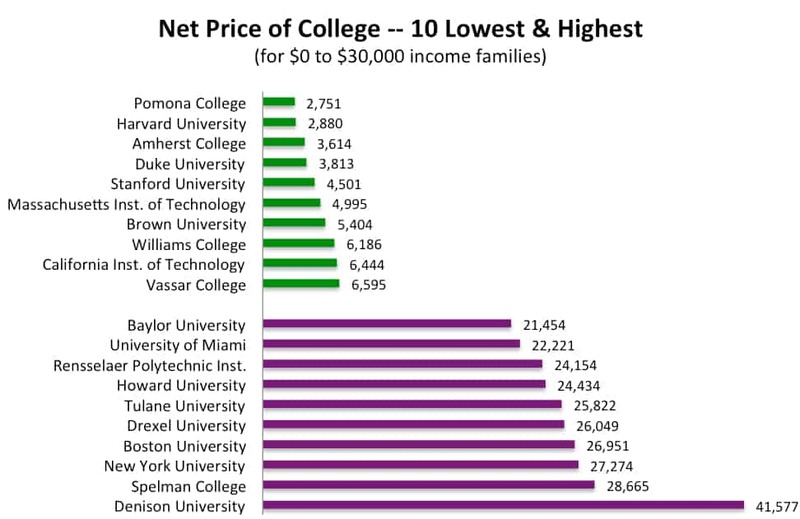 When Becker ran the calculations for well-known private schools for the poorest families (household incomes from $0 to $30,000), Pomona was the most generous for low-income students. The liberal arts college only charged $2,751. You can’t generate the most accurate net prices for your own family by using Cost of Learning’s universal net price calculator, but it is an excellent tool to produce quick net prices at different institutions and to compare these prices easily with competitive institutions. One of the advantages of using the Cost of Living’s universal calculator is that you don’t have to plug in all your financial information on the site. You just need your EFC. I’d urge you to play around with this calculator and share what you discovered in the comment box below. In my case this doesn’t match what I saw for my first daughter last year, but we may have an unusual situation. Our EFC is very low ($358) because I have retired and have a very low income. We are living off of our assets. All of our assets are in either an IRA or a family owned business (<100 employees, majority owned by the family, $1.4M in assets) so the FAFSA does not look at either of them. Schools that use the Profile don't exclude the assets of the family owned business. With most profile schools our net price is very near list price. The exception is a few of the highly selective schools. Harvard is about $4,000, but Princeton is about $42,000. Hi Lynn. This is certainly a handy resource. I have twins that will be seniors in the coming school year, graduating in May 2015, so the topic of college costs is pretty high on my list right now. In using this calculator, am I correct in thinking that any merit aid would reduce the cost further? You mentioned that this calculator did not take merit aid into account, but I want to make certain that I am looking at it correctly. I am an avid follower of your blog. Thank you for all your help and advice. You are right that this calculator doesn’t take merit aid into consideration. Most schools provide merit aid to students, but about two dozen of the most elite ones do not. Also, some extremely selective schools provide few merit scholarships. I’d use an institution’s regular net price calculator to get a better handle on the net prices for your children. Of course, your net price should be lower at the start because you have twins. For FAFSA schools, the EFC for two children in college simultaneously will be about 50% lower and for PROFILE schools about 40% lower. For many schools, the price would be lower than what the calculator suggests since merit aid isn’t included. That said, a minority of schools (highly elite) don’t provide merit aid.